Address: 649154, Republic Altay, Tourachaksky r-n., selo Artybash. 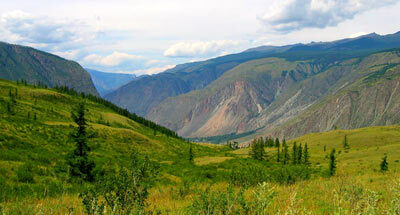 Zapovednik Altaisky, within North-Eastern and Central Altai was established in 1932. It was closed in 1951-57 and in 1561-67 and has been existing in its present day boundaries since 1981. 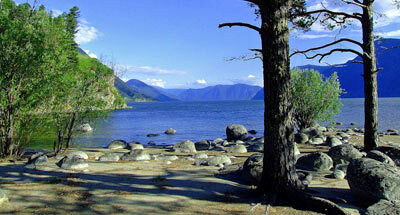 Its area is 88l,2 thousand ha, including 28,8 thousand ha of wetlands and Lake Teletskoye water area. It is located on the north-eastern and eastern shore of Lake Teletskoye, occupies the basins of the Chulyshman River and its right tributaries (Shavla, Chulcha, etc.) and the rivers flowing into Lake Teletskoye (Kyga, Koksha, etc.). It comprises Chulyshmanskoye Upland, the south-facing slope of the Korbu Mountain Range, southwestern slope on Shapshalsky Range. The elevation ranges from 429 m to 3300 m above the sea level. The highest elevations are as follows: 3507 m (Shapshalsky Range on the Zapovednik boundary) and 3111 m above the sea level (Mount Kurkurabazhi). There are numerous waterfalls and high-mountain lakes. The following altitude vegetation zones are recorded: steppe, forest, alpestrine and alpine. Steppes are located on the shores of Teletskoye lake and river Chulyshman's valley; they are formed of feather grass, sheep's fescue and xerophilous forbs. Woodland accounts for over 45% of the total area; the timberline is at an elevation of 1800-1900 m above the sea level. In the north fir forests prevail, which are replaced in the south by Siberian pine-fir, Siberian pine-larch and larch open woodlands. There are plots of small spruce and pine forests. The major forest-forming species is the Siberian pine, some individuals of which being over 600 years old. On glades forest tall herbs donunate: monkshood, Bupleurum аureum, Crepis sibirica, etc. Derivative birch and aspen forests occur. Sub-alpine vegetation covers up to 14% of the area. It is formed by open woodland and tall-grass meadows: crane’s bill. At higher elevations, dwarf birch communities are located, with fragments of alpine-meadow vegetation. In dwarf birch forests the moss-lichen cover is well-developed. The Alpine zone is represented by forb meadows and mountain tundras (shrub, lichen and stony). 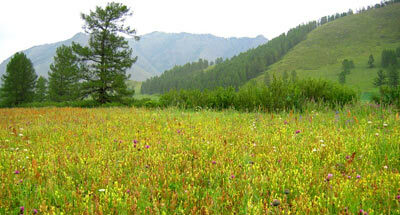 The Flora is exceptionally rich, with about 1500 vascular plant species. Many plants are relict as asarabacca, woodruff, military orchis, Neottianthe cucullata. There are about 70 mammal species. The Caspian deer, brown bear, and sable are widespread. The musk deer dwells dark coniferous taiga. On the rocks of Chulyshmanskaya Valley and Shapshalsky Range dwell the Asiatic ibex and argali. The Chulyshmanskoye Upland is the habitat of wild reindeer. The snow leopard is very rare. On steppe sites, long-tailed Siberian souslik is common, while the Altai marmot is more rare. The avifauna is typically mountain-taiga, with some steppe species. More than 300 avian species are recorded. The Zapovednik avian dwellers are listed in the Red Data Book of the Russian Federation, there are met: golden eagle, the Altai snow partridge, black stork. Lake Teletskoye and rivers flowing into it are home to gray ling, taimen, lenok (Brachy-mystax lenok), and the Chulyshman River Altai osman.